Exchange Bank Building in December 2009. 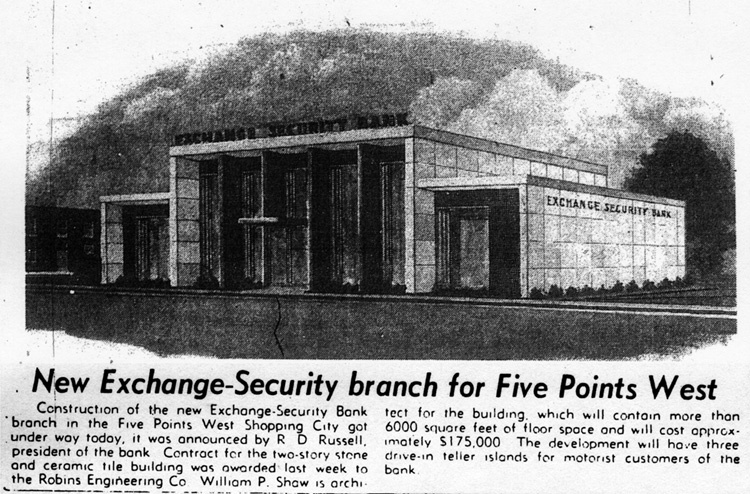 The Exchange Security Bank of Birmingham, along with the First National Bank of Montgomery and First National Bank of Huntsville, was one of the banks that merged on July 13, 1971 to form First Alabama Bancshares (now Regions Bank). The bank's president was R. D. Russell. In the 1930s the bank had an office in the Spanish Stores on Five Points South. The Exchange Bank Building was constructed on 20th Street South and 10th Avenue South in 1947. The stripped-classicist modern concrete building was the first banking office in the city to have a drive-up window and its own parking lot. When it was built, the north and south wings of the building housed the Five Points Shoe Hospital and a Mary Ball Candies store, respectively. A two-story stone and tile branch office designed by William Shaw was completed at Five Points West in 1960. That 6,000 square foot branch was constructed for $175,000 and featured three drive-in teller islands. A one-story brick branch building opened at the Mountain Brook Shopping Center in February 1964. It was followed by another small branch at 1013 Vanderbilt Road which opened on October 22, 1965. This page was last modified on 1 October 2015, at 09:09.